I never took my eyes off the gun. The man’s hand shook. I was afraid it would go off. Raising my own hands, I prayed that he would not shoot, and said “I’m coming out,” slowly climbing out of the window, placing one foot on the ground and then the other as I exited the ACME supermarket warehouse building two blocks from my home. Two other teens followed, each hoping the old gray-haired man in the rumpled uniform would not lose his cool and hurt someone. The security guard caught us leaving the building. 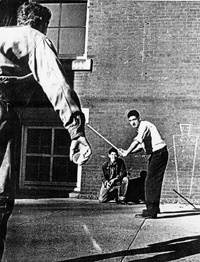 It was the second time in an hour that six of us — ages 13 to 15 — had meandered through the six-story building and made our way to the roof where we filled shopping bags with “halfies,” parts of round pimple balls that had split and enabled us to play “half ball.” In the 50s, 60s, and 70s, urban kids played a version of baseball using one-half of a round inflated rubber ball that had been damaged and eventually cut in half. The entire ball was called a “whole ball,” which we’d play with until it sprung a leak. We’d trim the “heads” off of brooms and mops, and simply use the handles as bats and played against a backdrop of buildings, sometimes row homes, or in this case, the six-story ACME building. Hit a half-ball over the roof and it was a home run. Both sides would agree that a ball hit over a certain mark, say the top of a window near the roof, was a triple, and the top of the lower window a double. Anything below was considered to be a single. That is if it bounced off the wall after being struck and no one caught it. A player was out if the other side caught the ball off the wall. You’d be called out if you’d hit the halfie and it never made it from the pavement where you stood, to the other side of the street and struck the building’s wall (or window!) And of course, three strikes and you’d be out. No one, I mean no one, had ever gotten to the roof of the ACME building until that day when someone left open a rear window at the 31st and Master streets facility in Brewerytown, Philadelphia. That includes all of the “old head.” Those fellows — who at that time were in their late teens and early to mid-20s — who came before us and played at the same site. Former “30th Streeters,” members of a gang who shot zip guns at each other for fun in nearby Fairmount Park. Or the “Green Street Counts” who roamed the Fairmount section long before Rocky Balboa ran up the steps of the area’s most famous landmark. Let’s not forget the African American gangs, “2-8,” which stood for the 28th Street Blacks that dominated to the north, or the notorious members of the “Valley,” who won’t tell anyone today, more than 50 years after the fact, where some bodies were placed. No statute of limitations on a homicide. But, we were good and clean kids who lived near 31st Street and Girard Avenue, a major thoroughfare of North Philadelphia. None of us were members of any gang. We were into sports and athletics. It just so happened we were in the wrong place at the wrong time when the guard got a radio call and drew his gun and arrested the three of us, while the others got away. I’ll never forget what happened. And, the lesson I learned when our parents were subpoenaed and appeared in juvenile court for our “criminal” behavior. But, that’s a story for another the next post called Brewerytown Part II! This entry was posted in Buddhist, detached retina, healing, Letting Go, meditation, Spiritual But Not Religious, understanding and tagged awakening, Brewerytown, Buddha, Buddha nature, enlightenment, gratitude, heartfelt, HIGHLY SENSITIVE PERSONS, meditate, mindfulness, Philadelphia, seeing, Spiritual, spirituality. I remember a Howard Brown from St. Ludwig’s. He was in my class along with Joe Cleary and Robert Richmond. I knew Clancy and other “old heads” like Joey Osborne, Jackie Toy and Eddie Keller who sang street corner harmony and appeared at the Uptown Theatre on Broad Street for a midnight show of a battle of the groups. They were the only whites in the theatre but got a hearty round of applause from the black audience after singing “Guardian Angels,” which later became a Doo Wop classic. WoW! My Cousin was Jackie Toy & passed over much too young in his late 40’s from Cancer leaving a Wife & 5 children. His Brother & my Cousin, Danny Toy lives in Springfield, Delaware County now & just turned 73. I also worked for Eddie Keller in 1993-94 as Director of Organizing for the Union. Eddie had moved to Harrisburg & became Executive Director of AFSCME, Dist. Council 13 statewide after Organizing AFCME in Penna in 1971 while working at the zoo as a bird attendant. Eddie lives in Hershey PA & lost his Son at 22 y/o a few years back after he retired. Eddie & Gerald McEntee (swamppoodle) started AFSCME statewide in Penna.. I grew up down near 20th & Green & all over that area. I would visit my Cousins Jackie & Danny Toy on a weekend from time to time due to my mother being sick & no father. I thought I was a world away from Green street when I went up to visit them in B-TOWN. My Uncle, Danny Toy coached little league in B-Town. I latered moved to Fairmount then to South Philly. I retired 7 years ago to Gulf Coast of Florida & fishing is my form of meditation now after falling down over the years, but picked myself up & now living a good life though alone. Thanks for the memories & your service. Bernie Novak, my Brother was Charles ‘Buddy’ Novak who passed over at 26 y/o in 1974 from a fall as a iron worker on West Philly nursing home after returning from Vietnam. Buddy was only sibling I had. Jackie Toy influenced me in so many ways. He taught me how to sing harmony and to crack jokes to make life seem a helluva easier. He was one of the “angels” that appeared in my life to guide me to where I was supposed to go. I’ll never forget him or the others from Brewerytown. I miss Johnny Keller, who was a best friend. He was about two or three years older than me, but I still remember going to his house after church services as his sister Bernadette made breakfast for us. I see her and her husband John Sossinavage at the Brewerytown reunions. I also heard from Joey Oz, (aka Joseph Osborne) a few months back. He’s still singing and I remember as if it was yesterday going to the Uptown Theatre on Broad Street in the heart of Philadelphia and cheering on his group of Doo Wop singers. We were the only whites in the crowd of black brothers and sisters. We had a ball and had no problem with everyone who shared a love of music. Music first made by blacks and once called “race” music. I sang with Joe Cleary and we appeared on Super Lou’s Dance Show on Channel 29. (Remember that station on what was called “UHF”?) It was the highlight of my singing career. Joe went on to cut a few records and still sings in Philly and New York. God, I miss those times. But you can recapture some of those memories by remembering how much heart we all hads. Like Eddie Keller organizing the zoo workers and becoming an executive of the state-wide office of AFSCME of PA. I once served as a union organizer for The Newspaper Guild and felt a kinship with him . . .
Bernie Novak. I’m going to pass that name onto the old heads at the next Brewerytown meeting next week. If you like, you could contact the organizer for more information and how to stay in touch with us! Take care my good man! I sent your article & kind memories to Jackie’s Brother, Danny Toy who lives in Springfield, Del. County. I will also see Danny when I come up for a visit the end of May.He may know more of the people you mention from Brewerytown than me though I do recognize a few names like Macpeak & Leonard. The ‘old heads’ probably wouldn’t know me, but maybe my Brother, Charles ‘Buddy” Novak who was 6 years older than me. Jackie was about his age as well. I always remember Jackie laughing, smiling & telling jokes. I found a picture in one of my Uncle’s belongings outside their house which I believe was on Dover St. with that big time smile & pompador hair? He was for sure a happy go lucky guy no matter what. Always made me laugh as a troubled younger kid. I enjoy your articles very much as so many do it appears. I especially enjoyed your article about Al Brown. As a young kid with no father & sickly single mother, I had a Al Brown type in my life as well. His name was Cecil Cole & he owned a body shop on North St. between 18th & Fairmount & Wallace Street. He did his best to steer me in the right direction & taught me so much about true humility by just his example. Unfortuantely, I went down the wrong path for many years after a traumatic event when I was 17 y/o that flipped a switch in me. Until then I was a decent kid who got 1st & 2nd Honors in Cathedral. I finally got it together at about age 33 or so, but not without leaving a lot of wreakage behind me. Life has been good now for many years & so often I think of Cecil Cole & how he was about the only Father figure in my life. When He died I was one of only 3-4 whites at his packed funeral & as a 9 y/o, cried like I lost my best friend. I didn’t care about the hooping & hollering praise & sadness I experienced at my first black funeral. His Son, Bill Cole came home from Serving in the Air Force & was very much like his Father & also tried to teach & guide me. Just good, decent, kind folk regardless of skin tone. Ashame that many today couldn’t have experienced a Al Brown or Cecil Cole in their life as children. Maybe we wouldnt have all the issues we still have today in our society? As a child I thought the whole world lived as we did, poor & mixed & all got along until I went to Stoddart- Fleischer junior high on east side of Broad street after getting kicked out of Catholic school. I had to fight almost daily & was the resident white kid. Later in life I understood why they resented me so much, but didn’t when it was going on. I had to dodge the Morrocos & other gangs on the way home. I would have been the same way as them I suspect & full of resentment in the 1950’s & 60’s if I had experienced what they & their parents went through. I am sure though that if they had a Al Brown or Cecil or Bill Cole in their life they would have been taught othwerwise & more about forgiveness & love rather than resentment & living in the past rather than today. I think of that man, Cecil & his son, Bill very often & thank them for their attempts & kindness with me as a child. Take care Michael & keep up with the great articles & memories of days past. I will pass that info on to my Cousin, Danny Toy. And again, Thank You for all your service. Thanks for your story about Cecil Cole. You should write more often. You got a hellava story to tell! The Acme building, are you talking about this one? In Philly myself, love to hear stories. Yes, the old ACME building. My brother, John, thought it was something else, but I should have gone with my initial instinct. Good to hear about he old neighborhood! Great article and comments. I am interested in learning more about the old gang (orginal and second) the green street counts. If anyone has any info they would like to share or get together to talk about it, I can explain further my goal and what I am looking for. Your cellar was still the best for all the times we had. They are some of the best memories from the neighborhood. Remember when my brother lured you into the cellar, and had you sit in the lawn chair? He tried to electrocute you! Shocked the hell out of you. He was crazy. And so were those days on Stiles Street around 31st and Girard in Brewerytown, Philadelphia. Great to hear from you, Bill. Long time, no see. You hear about the reunion? St. Ludwig’s. Sister Josephine Francis says you have an overdue Catechism book she remembers writing in your “permanent record.” She wants to collect. She says you owe for a Pagan Baby, too! Gotta stay in touch. Take care. Mike, still brings back smiles for all the stuff we did. I do remember “JARC ” AKA John trying all sorts of stuff. Even when he talked through you TV while we were down cellar scared the daylights out of your Mom & Dad. Still fond memories of your Parents, goat cheese and the licorice liquor. Best of all were weekends with music & the Gang. We may not have had a lot but knew what to do with what we had. Good to hear from you. will be in touch again . Thanks. I understood everything except “JARC,” for my brother John Achilles R_________ Contos. What did the R stand for, Robert, Reginald, Rupert? The white goat’s chesse was Feta, and the licorice-tasting drink was Ouzo. I drink Jameson Irish Whiskey and think of you and your family. Every chance I get. Whether I need to or not. I still remember the one and only date I had with your sister, Annie. We saw “Tom Jones,” which won a best picture about a century ago. Take care. Great memories, aren’t they? Was that the “Beaver?” Sometimes I felt more Eddie Haskell. I have done some dangerous things my self. I learned from those mistakes too. You always express your feelings in a way that I understand in my heart. Someday, you and Oleg must tell me and my Nicholas about the trying times in Ukraine and the dangers you faced under Communist rule.